According to this article in the Wall Street Journal, baby boomers are increasingly turning to prenuptial agreements as estate planning tools to make sure their premarital assets will be inherited by their children. The financial crisis—which hit boomers, those born between 1946 and 1964, especially hard—accelerated the trend. Many of them, just on the cusp of retirement, saw their investment portfolios pounded . . . . As a result, boomers have become more anxious to hold on to whatever they have left. Baby boomers are more likely to enter a marriage with substantial assets and children from an earlier marriage. Baby boomers are more likely to get married multiple times than younger or older couples because they also are more likely to have gotten divorced. Almost 40% of boomers who have been married have gone through at least one divorce, according to 2004 Census data, the most recent available, while only about 30% of all people who have been married have been divorced. By their 50th birthday, 27% of boomers have moved on to their second or third marriage. . . . The drafting of a prenuptial agreement, and the discussion surrounding it, should begin several months before the wedding date. If the signing terms of a prenup are later deemed rushed or ill-informed, a court can choose not to enforce the contract. 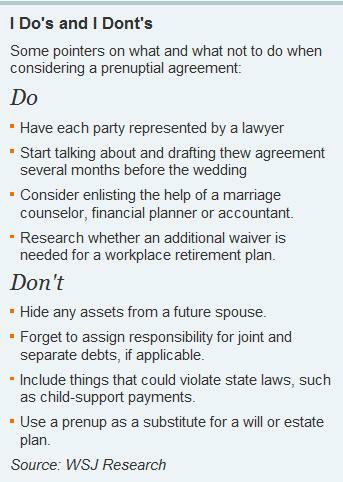 Prenups are contracts, after all, and lawyers rely on decades of case law for guidance in drafting them. That has made the documents more complicated. Popping the Other Question: Will You Sign a Prenup? (Wall St. Journal, July 3, 2010). Why is Mel Gibson Allowed Unsupervised Contact With His Child?